AAF was founded in 1999 by William Ramsay to offer people the opportunity to buy contemporary art and show them that you don't need to be a millionaire with a Doctorate in Fine Art to buy it. Launched in London 12 years ago, the Affordable Art Fair is now in cities all over the world, including Amsterdam, Brussels, New York, Melbourne and Milan. Singapore played host to the first Asian edition in 2010. 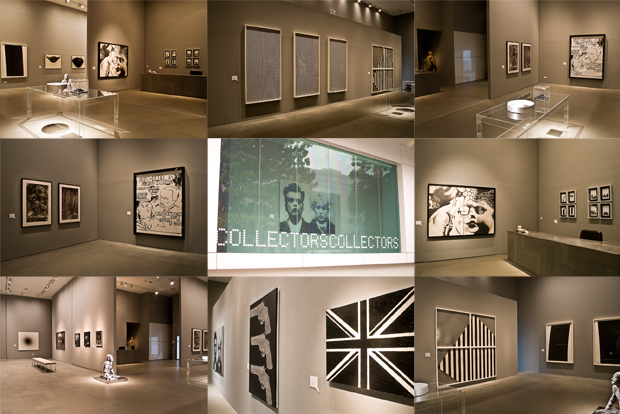 Collectors Contemporary is proud to be a part of AAF 2011. Featured artists include Takashi Murakami, Peter Blake, Tim Sullivan, Tim Liddy, Static, Vanessa Blaikie, Crystal Liu, David Gremard Romero, Joey Piziali and The Little Artists (aka Cake & Neave). ***As our entire team will be at the fair, the gallery will be closed from the 16th to the 21st of November. We look forward to seeing you at AAF 2011. In Fragments, Blake seeks to draw attention to our ideas of the aesthetic by purposefully de-constructing figurative sculpture. Working in clay, later casting in bronze, Blake deliberately 'de-sculpts', breaking his creations to make them resemble their timeless counterparts. Fragments embodies the struggles of individuals in the face of war. Their broken bodies are as anonymous as the civilian casualties of armed conflict. The Fragments sculptures are beautiful, worn down, and yet conversely, full of life and triumph as symbols of survival and a hopeful future. Since the beginning of the international Fragments sculpture tour in London in 2007, the Fragments sculptures have become symbols of hope for activists working to remove the scourge of landmines from developing countries. In association with No-More-Landmines, Adopt-A-Minefield of the United Nations and the Canadian Landmine Foundation, Fragments sculptures have already cleared minefields in Vietnam and Afghanistan, mapped minefields in Angola, removed cluster munitions in Kosovo, and provided mine-risk education to children in several developing countries. Born in Northern Canada, Blake earned an honors degree in Fine Arts from the University of Alberta before pursuing his study in figurative sculpture in the art capitals of Europe. Collectors Contemporary presents the second installment of the highly successful Pop! an exhibition celebrating a genre that has become a perennial favourite. Together with works by early Pop superstars such as Andy Warhol, Keith Haring and John Baldessari, this showcase also presents works by current sensations Takashi Murakami, Cake & Neave, Russell Young and Static, amongst others. Offering art audiences an exciting opportunity to appreciate its evolution and legacy. The Pop Art movement began in the 50s, reflecting the post-war society fascination with popular culture. It celebrated everyday objects such as soup cans, washing powder, comic strips and soda bottles etc., transforming the banal into icons that characterized the era. As we move into the second decade of the millennia, pop culture has never been more celebrated. A resurgence of this movement can be seen the world over, influencing artists from Latin America, Europe, Southeast Asia, China, Korea and Japan. POP! POP! pays homage to the pioneers of this movement whilst exploring its legacy. Vanessa Blaikie received her MFA in painting from the San Francisco Art Institute in 2004, and her BA in Art History and Visual Arts from Columbia University, New York. She has exhibited work throughout San Francisco at Build Gallery, Root Division and at Gallery 16. "It is nothing more, and nothing less, than the unfolding of a space in which it is once more possible to think." These works on paper are quiet meditations, minimal gestures that animate and activate the surrounding empty space. Emptiness is the beginning, and from emptiness, comes form. "Emptiness is form and form is emptiness." In the void of the white page, subtle dots, lines, and colors, meet, fall, fill, and commingle, allowing for invisible things to happen and be seen. In their bare simplicity, these gestures are fragments that quietly suggest the complexity and fullness of the surrounding white void. the emptiness of the page, and the emptiness of the greater surrounding space. "As inspiration for this space, I look to the natural landscape, alluding to endless horizons, the vastness of the sky, the glow of the sun, the peaks of mountains and waves. Space and emptiness are the body of all things, and are what allows other things to exist. I often think of the silent space between sounds, the moments wherein single words on a page, like accents, quietly orchestrate the harmonic relation of the whole. Smaller parts cohere to create larger wholes, and it is the spaces, the emptiness between elements that ultimately hold the individual parts together and allow everything to commingle and co-exist." "I aim to produce paintings that arouse both a sense of well being and pleasure, whilst simultaneously suggesting notions of insecurity, fantasy and sexuality. Entirely suspended by water, my figures are sometimes in perpetual motion and sometimes simply floating motionless and in limbo. Each paintings consists of about 20 to 30 glazes in order to denote the sense of water and to truly encapsulate the figure within. I am fascinated with the appearance of body contours that exaggerate under the magnification and distortion of the glassy water which surround my figures. Their forms are fragmented and further disfigured by the ripples and swirls created by the movement of the water, abstracting their appearance, often with implausible results. I am greatly influenced by Francis Bacons' Carcass and crucifixion paintings, and of course by the work of Jenny Saville. With this, I have become increasingly excited about the abstract elements in these works, and the interplay between light, colour and water. The emerging patterns are becoming more apparent and dominant, drawing the eye not only towards the main focal point of the human form, but also to the surrounding areas, which are of equal significance. The work is without a horizon line, so not to have any reference of anything solid to draw perspectives upon. The process of reaching the final image I paint often involves piecing together multiple images in order to further manipulate and accentuate perspectives and distortions. I work from a number of images that either I have taken, or I have posed for, and these go through a long manner of manipulation before they are used, although much of my work is from my imagination also." • Exhibiting contemporary art and design galleries/dealers; the best and most interesting from the Asia Pacific juxtaposed against and in a dialogue with carefully selected Western positions. • Focus on quality through strict selection of the exhibitors. Artists showcased include Andy Warhol, Robert Rauscheberg, Roy Lichtenstein, Keith Haring, David Hockney, James Rosenquist, Ed Ruscha, Thomas Ruff, Gottfried Helnwein, Faile, Chris Levine, Russell Young, Enrique Chagoya, Cake & Neave, Tim Sullivan, Crystal Liu, Joey Piziali, Sarah Harvey, John Westmark, Nerina Lascelles, David Gremard Romero, Vanessa Blaikie, Blake Ward and others.